Hoya shepherdii Short ex Hook. A 100% Positive Feedback eBay Seller! How in heaven’s name can an eBay seller who offers what looks like just taken 1 node cuttings (2 leaves with absolutely no new growth visible in pictures) of almost 100% mislabeled species, earn a 100% positive feedback??? I formerly has all the details concerning the false advertising of this seller here but this seller threatened to sue me if I did not remove my critique. I know that I could win the law suit because I can prove that every word I said is true, however, even the winner of a lawsuit has to pay a lawyer and spend a lot of time away from home. I have neither the time nor the money. If this seller should by any remote chance win, she’d be the big loser because I don’t own anything but a ten year old car (with a lot of mileage and threadbare tires) and a lot of hoyas, all of which would be dead by the time a trial would be over as I have no one to care for them when I’m not at home. If any of you would like my personal opinion about any eBay or catalog hoya offering, I’ll be happy to tell you what my opinion is. My e-mail address is thehoyan@bellsouth.net. I may not be able to identify the plants you question but I think I’ll be better able to than most people. I can almost always tell you what a hoya isn’t, even if I can’t tell you what it is. By the way, this seller whose critique I had to remove from this site says that she is praying for me. Why is it that these days, whenever someone catches another in the wrong that person says, “I’m praying for you?” Why, I wonder, and for what? That I’ll be forgiven for telling the truth? When did honesty and free speech become sins? 1). He lists a Hoya angustifolia (2 times) but whatever it is (or they are), it is not Hoya angustifolia. The Code’s “law of precedence” dictates that only one species can have that name and the one published by James Traill, circa 1830 is that one. Even though it turned out that Hoya angustifolia Traill is a narrow leaf clone of Hoya pottsii, doesn’t mean that the name can be recycled and used for another species. The Code doesn’t allow it. Whatever Paul Shirley has, it is not Hoya angustifolia. 2). He lists a Hoya burtonii. There is no such hoya. It, if it is what he thinks it is, is Hoya burtoniae, because it was named for a female (me). The ii ending tells us it was named for a man. 3). Hoya carnosa compacta should be Hoya compacta. 4). Crinkle-8 should be Krinkle-8. 5). Unless someone has snuck in a new publication in the last few days, there is no such hoya as Hoya coloura. 6). There is no such hoya as Hoya halophylla. If this is what Mr. Shirley thinks it is, which I doubt, the name is Hoya halophila. The name halophila means “salt lover.” It was named that because Schlechter found it growing on sea shores in Papua New Guinea and nearby islands. Even though the two names look to us, English speaking dummies, like the same word spelled differently, they belong to two different languages and have two different meanings. As noted above, halophila (a Greek compound word) means, “salt loving.” Halophylla is Latin. “The word halo, in Latin means, “circle around the sun or the moon.” A phylla is a leaf. I guarantee that there is no hoya that has ever been named for a leaf in a circle around the sun or the moon. 7). I 100% guarantee that the hoya pictured as Hoya macgregorii is NOT that species. No way could a hoya species, with a well preserved holotype specimen, having an umbel of flowers on it, no larger in diameter than a US quarter be that ugly thing with an umbel of flowers about the size of a softball. 8). The cultivar name is ‘Minibelle,’ but Mr. Shirley calls it mini bell. The cultivar, Minibelle, was named for Minibelle Hummel, the wife of its hybridizer. The Code dictates that cultivar names be upper cased. 9). Hoya paziae is not in circulation. What he has, is a cultivar, named ‘Iris Marie,’ that is posing as Hoya paziae. 10). I am sure that the one posing as Hoya picta it not that species. Blume left us a very good drawing of his Hoya picta and it doesn’t match this one. 11). 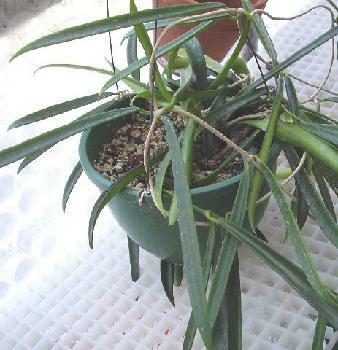 The cultivar is Pink Silver, not pink silver. Cultivar names should, per the Code, be upper cased. 12). No way on earth can the one labeled Hoya ruscifolia be that species. I am sure that what he has is Hoya bilobata. Hoya ruscifolia is, in my opinion, the Philippine version of Hoya curtisii. It certainly looks like it to me. If I am right, then Hoya ruscifolia is the correct name for Hoya curtisii. 13). The name is Hoya thomsonii. There is no P in that name. 14). He listed a USDA-81079. It is not a hoya but I don’t have a clue as to what it is. It could be wheat, corn, skunk cabbage of any one of (by now) at least one hundred thousand other things imported into the US by the USDA. However, I know that the hoya number 81079 is a Ted Green number. The first time I encountered this number was in Ted Green’s 1983 catalog. It is Hoya obscura. NOTE: Just before David Liddle died, I started getting letters from people who knew that I bought lots of cuttings from him and that I had sent him several consignments. These letters were from people who wanted to take advantage of the shipping discount that such an order provides. My consignment was sent very early in the year and it arrived in August. I did not make a record of when it arrived but put the date of 8-09 on all the labels of cuttings I planted from that order. I don’t know if others sent orders to Mr. Liddle before I did or after I did. I don’t much care. I believe that the Liddles fill orders in the order received but, not being there peeping over their shoulders, I couldn’t swear to it. If they don’t, it’s their business. If they want to push a special friend or a valued customer ahead of me, I don’t mind, as long as my order arrives before freezing weather. I was sent copies of Dave’s Garden letters written by two very disgruntled “wannabe” hoyas authorities, vilifying David Liddle for sending orders that came to him later than theirs, before filling their orders and for being very uncommunicative. How they’d know when David Liddle received orders from others, I don’t know. I suspect they were only guessing. I don’t know what their expectations were. I can only tell you of my experience. I never wrote a snail mail letter nor an e-mail letter to David Liddle that he didn’t answer. Of course, I didn’t expect a step by step report from him daily about the status of my order. I sent the order and only asked that he acknowledge getting the order. Then I waited for it to arrive. In every case, the plants were sent before he even sent a bill. Giving credit for such a large number of cuttings (or for anything else) went out of style about 1940. The man trusted us. He didn’t deserve being trashed as he was on that DG forum. One of the Wannabe Hoya Authorities, added at the end of her trashing of David Liddle, a statement to the effect that David Liddle didn’t have any hoyas that could not be purchased from a USA seller for a lot less money. She recommended two US sellers, saying that both of them are “extremely honest.” Quiet frankly, I resent being told I should buy from those two “extremely honest” sellers. Let me tell you a very tiny bit of what I know about an “extremely honest” hoya seller. The year was 1981. I was editor of The Hoyan. Each issue posted deadline dates for all copy that was to be published there. The deadline was two months prior to the desired publication issue. The reason was that the bulletins had to be printed by offset, as no one had a computer that was capable of printing a bulletin. Medal plates had to be made for each sheet printed. That was very expensive. Our printer gave us a tremendous discount, mostly as a favor to my husband who sent him a lot of work from the GA Professional Engineers’ Society publication. There was a string attached. We had to have our camera ready copy to him two months before it was needed. The reason was that there were times when business was slow but he still had to pay his help. He said that with the two month deadline, he could work The Hoyan in during those slow periods. This “extremely honest man” seemed to think that the 2 month deadline applied to everyone but him. He never, not even once, sent his ads or articles on time and I always had to hold them over until the next issue. Each time, he complained to the HSI officers and board members, saying that Chris Burton was trying to ruin his business. The turkey even tried to claim that he’d never been told there was a 2 month deadline, even though said deadlines were published in every issue of The Hoyan. Each quarterly issue of The Hoyan was mailed on the 16th day of the quarter. The Winter 1981 issue was due to go out in only a few days, when I got a letter from this “extremely honest man.” The letter was dated early December and postmarked around the 12th of January. This “extremely honest man” wanted an ad to go in that Winter 1981 (January) issue. The bulletins were mailed from Texas and I knew that by then, they’d probably already be collated; in their envelopes, addressed and the envelopes sealed. No way could that ad go in that issue. He’d phoned and said he’d pay for a full page to be added and he’d send the page. I said, only if Bobby had not sealed the envelopes yet. Soon as he hung up, I got another phone call that required me to take the next flight to Western Massachusetts for a family emergency. This “extremely honest man” did not get his 2 month late ad in the January issue of The Hoyan. For the umpteenth time, or so it seemed, every officer and board member of HSI got a letter demanding that Chris Burton be ousted as editor of The Hoyan, because she was trying to ruin his business. Said officers, backed me up. The ad that didn’t get into the January issue was for a book that this “extremely honest man” said he’d written about hoyas. He stated in that ad that it was being published by the University of Hawaii Press in September of 1981. He gave the name of the person he said was the editor and an address and told people they could order copies at that address. Remember, he wanted that in the January issue of The Hoyan and was trying to get me ousted when it didn’t get into that issue. I’d thought that was the end of that. Then one day, I sat down for lunch and as I ate I watched the news on WSB-TB (at that time an NBC affiliate, now ABC). I was surprised to see my daughter, who was associate news producer, interviewing Elvin McDonald. Vicki didn’t like going on camera but sometimes she had to when all reporters were on serious assignments elsewhere. Elvin McDonald was a member of HSI and the Garden Writers Association of America as was I, though I’d never met him or corresponded with him prior to that day. He’d been invited to do a series of lectures and a book signing at Atlanta Botanical Garden, which arranged for the interview on WSB to promote the lectures. Elvin was probably the best known of all Garden Writers during the 1960s, 1970s and 1980s. He wrote numerous gardening books; wrote a gardening column which was featured in just about every major newspaper in the USA, Canada and several European countries. He was also garden editor of Family Circle Magazine. Elvin told me that he’d interviewed this “extremely honest man” for an article he’d written for Family Circle Magazine. Elvin’s article about this man and the free publicity about the book that was coming out in September appeared in Family Circle’s February issue (a full month after it didn’t go in the January issue of The Hoyan). Many HSI members (including me) wrote to the named editor at University of Hawaii Press and asked for the price of the book. All were told that, “We don’t know anything about this book or the author. We have not had a manuscript presented to us and if one came in today, and if it were accepted for publication, it would take at least a year to schedule it for publication and somewhat longer to actually get it published.” I wrote to them three years in a row and got the same answer. It definitely would not be published in September of 1981. (It still hasn’t appeared in 2010). I told Elvin about how “extremely honest man” tried to get me booted from The Hoyan for not publishing the same thing a full month earlier. He asked me to write a letter to Family Circle on his behalf. I did and I sent copies of all the correspondence I had from “extremely honest man,” concerning this publication. I sent Elvin copies also. Family Circle then offered him his job back but by then, Elvin had a better job with House Beautiful. Just how honest is “extremely honest man?” So honest that he was willing to let the father of several children lose his job ( and means of support for those children) in order to save face! And if the letters I’ve gotten from others over the years can be believed (and I believe them), that one incident is just the tip of the iceberg! Maybe he’s become “born agin?” Don’t tell me. I am sure there are true Christians who have been, figuratively speaking, “spiritually born again,” but whenever I hear people, who have something to sell, tell me that they’ve been ‘born agin,” I know to watch my back because someone is about to try to cheat me out of the life’s savings he thinks I have. Recently I read a statement by “Extremely Honest Man,” that he had always thought that the hoya now known as Hoya vanuatuensis was Hoya diptera but now knew they were different species. I say that statement is false. I know because I bought that same identical hoya from him when he put out his own first retail hoya list. He sold it to me labeled Hoya chlorantha. As soon as I got it, I knew it was mislabeled. I wrote him a letter and enclosed a copy of Rechinger’s original Hoya chlorantha publication which included both a written description and illustrations. I told him that what he’d sent me was not what I ordered. It definitely was not Hoya chlorantha. He answered my complaint by writing, “Yes, I caught that too, but I had to call it something.” He admitted that he’d sold a cutting that he KNEW was mislabeled because he “had to call it something.” What was wrong with giving it a collection number and saying right up front, “I don’t know what it is?” That’s honest? Yes, dear friends, I kept that letter. It is still in my office file cabinet. Now I read, on the Internet, letters by “Wannabe Hoya Authority,” saying that I should buy from this “extremely honest hoya seller” because he is extremely honest and American! I believe, very strongly in “buying American” whenever I can but I believe more strongly in buying from “truly extremely honest merchants.” The one “Wannabe Hoya Authority” says I should buy from simply does not, in my opinion, qualify. Plus that, he won’t sell to me. The reason he gave me was, “You’ll criticize my labeling.” I reply to that was, “I’ll criticize your labeling anyway and you won’t have my money in your pocket.” Gimme a break! ANSWER: Again, my answer is the same as the last dozen or so times I was asked. There is no such hoya as Hoya pubifera. A plant species name doesn’t officially exist until it is validly published. Hoya pubifera has never been validly published. A.D.E. Elmer tried to publish a Hoya pubifera back in 1938 but his publication is not recognized because it was written entirely in English and the Code required a Latin diagnosis for all species published after 1935. To date, no one has seen fit to validate his publication. Even should the name be validated, the hoyas sold by David Liddle as “Hoya aff. pubifera” (IML-1301 & IML-1282) could not be considered as being that species. As you see, all my “preaching” hasn’t even gotten to my friends. What I have preached is, “For goodness sake, don’t put a name of any kind on an unidentified hoya until you know what it is; just give it a number!” Once you do have a name on it, right or wrong leave it alone until you can finally get it right. NEVER! NEVER! NEVER remove the collector’s number (IML #s or DMC #s, etc.) because, as more is learned about these things the names those numbers represent get changed. For example, there is one IML-number that I know about that had a different species name given it in 3 or 4 consecutive year’s catalogs. Here is why I know that IML-1301 & IML-1282 are not Hoya pubifera and cannot be called that, even should Elmer’s publication be validated. 1). Elmer’s holotype specimen did not have a single flower on it. None of his isotypes had a single flower either. Since many plants of many genera have paired leaves and a vining habit (Aeschynanthus and Dischidia for example) Elmer’s plant could be some other genus. PLEASE correct your labels to either IML-1301 or IML-1282 (whichever you have) and leave the Hoya pubifera off because neither of them is that species, nor do either of them resemble authentic material cited by Elmer. Both of these plants are completely glabrous…. Not a hair on either.